That’s not me, of course, but I have been subjected to TSA invasive pat-downs now three times on my book tour travels, even though I have Pre-Check. Is Pre-check just a scam? It is no good, doesn’t help you. I have decided I can’t take it any more and I will refuse absolutely the next time they tell me to step aside for major groping. It is horrible, humiliating, and they always loudly announce everything so the passengers and security all around will look over as they stick their hands into everything. Which guarantees you no privacy, no way to avoid the horrified stares of passengers — men and women — all around. This has happened to me now THREE TIMES. This last time I went through the body – scan and then also the groping. Why? Who knows? The first time was last spring, St. Louis trip, to read at St. Louis Public Library. Forced to go through the scanner for no known reason, had my hands wiped, and then the horrible groping. Next time: Asheville NC, in October. The girl at the entry said my ticket name Paulette Jiles, didn’t match my ID name, Texas driver’s license says my married name, Paulette Jiles-Johnson. This meant a really horrible groping by a big woman in a nearly-empty airport who said loudly ‘Now I am going to touch your genital area! Now I am going to press my hand against your breasts!’ I just stared off into the distance. She said in a loud voice ‘Are you listening to me!! ?’ You figure that out. This last time was going to San Francisco, last weekend. I was ordered to go through the body scanner when I had six minutes to catch my plane. I was late. So naturally they had to subject me to AGAIN the body scanner and then I had to take off my shoes, and then my sweater, and get groped by a TSA woman. I kept saying why? Why? I’ve already been through the scanner! ‘Now I am going to touch your genital area! Now I am going to press my hand against your breasts! And they stick their hand down into your waistband and you have to stand there with your feet apart and your hands out to the side like a dirty low criminal. And so one of them said, ‘It was probably your wrist brace’. This is from when I broke my arm. So I took it off and threw it in their wastebasket. The I just ran for my plane to Dallas/Frisco. I was just about in a state of terror returning. That ticket also just said Paulette Jiles (instead of like my driver’s license which say s Paulette Jiles-Johnson) and I thought Oh my God no! Not again! But the TSA woman just looked at the two and said ‘Go on’. Totally arbitrary, totally up to their whims. But it’s not going to happen any more. I don’t think they can handcuff you and force you to endure a groping if you refuse, you just get thrown out of the airport, which to me would be a very very happy day. No more flying for me! Yay! I would be delighted if I never had to get on a plane again. So no matter where I am, San Francisco or anyplace else, I will refuse to let these people humiliate me in front of everybody in a public place. I will get home by train or whatever, any way I can. I am telling my publicity agent at Harper Collins that I am going to refuse to get groped, scanned and felt up again. 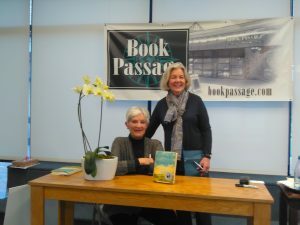 And so here are some pictures from San Francisco, the wonderful bookstore called Book Passage in Sausalito. . I did not feel happy after having gone through TSA abuse and humiliation but I did my best to speak, sign books and be charming. 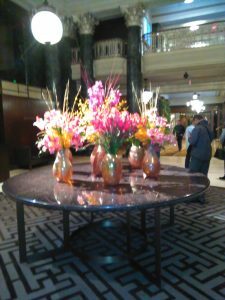 Here were the flowers in the lobby of the hotel — they were really very calming and beautiful and I just stood and looked at them for a long time. This entry was posted in News on February 2, 2017 by admin.